It's no secret that I love DIY projects, especially as gifts for my friends and family. I think they are so nice to give to people because it shows you like to put in a little extra effort for them, and the projects are usually so much fun! 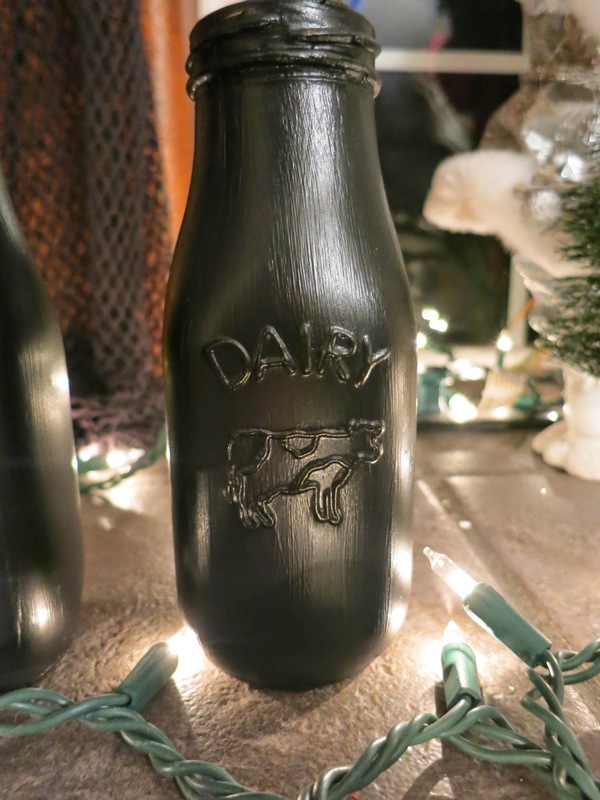 While Christmas shopping this year, I saw cute little milk bottles at my local craft store, and just had to do a project with them for gifts. So, I went on the hunt for gold and chalkboard paint in order to make a gold dipped (I love gold things if you haven't noticed) milk bottle, as well as one painted entirely with chalkboard paint. They were both really easy to do, but I will include how I painted them step by step, as well as the supplies you will need! 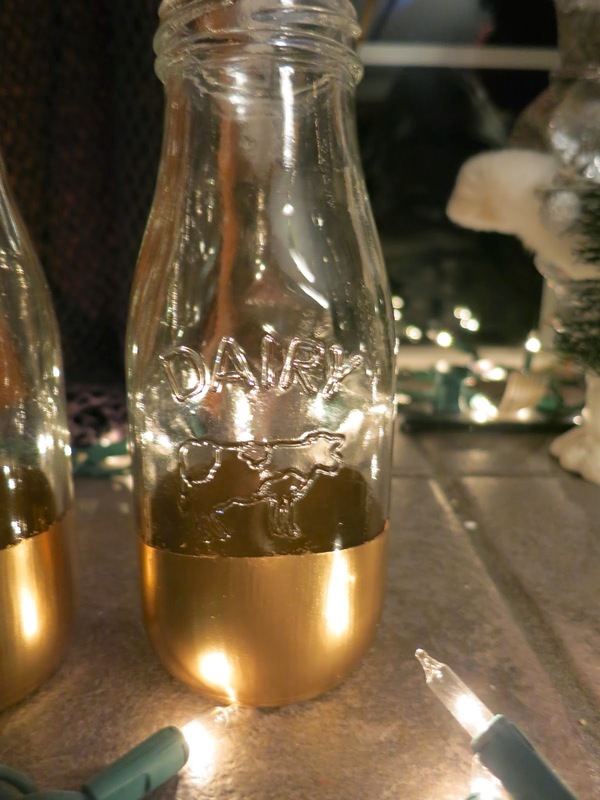 For this project, you'll need however many milk bottles you want to paint, painters tape, Liquid Leaf (or any other gold paint you can find, I found the Liquid Leaf at Michael's), and a brush of some sort. If you do use Liquid Leaf, you actually need to use a paint brush with bristles, but use a cheap one unless you have a good cleaner to immediately clean off the paint, or else it will ruin the brush! Tape off the part that you don't want to paint with the gold, but you don't need to tape off the whole bottle. Just make sure the line is straight and even all around the bottle! I just had to take a picture of the Liquid Leaf - how cool does it look?! Turn the bottle upside down, and simply paint! Make sure you paint in the same direction (I did up and down brush strokes) around the whole bottle. I did put two coats on one bottle, but there was no visible difference between two coats and one when I compared the two bottles. That's it, you're done! Carefully take off the tape, and make sure the bottles are completely dry before you do anything with them! I think these are perfect to use a vases, decorations, or anything else you can think of to use them for. This method could also easily be used to make anything else you would want "gold dipped." I also painted a giant seashell gold for my grandma for Christmas because she loves the beach, and it turned out great! For the chalkboard bottles, you'll need milk bottles, chalkboard paint (you can find this at any craft store, usually by the acrylic craft paint), one of these little sponge brushes, and newspaper to put under the bottles while painting. Turn the bottles upside down, and paint away! Again, make sure your brush strokes are consistent the whole way around the bottle. I had to do three coats of chalkboard paint in order to make it completely opaque, and make sure the previous coat is completely dry before you apply another one. I love how the chalkboard paint looks on the bottles, especially next to the gold dipped ones! This would be really cute to hold things that you could label with chalk. I also think they would look really cool with bright daisies in them! Have you been liking the gold dipped and chalkboard paint trend lately? Yeah I agree - especially makeup brushes! Thanks! :) Happy New Year!! These gifts are so cute and perfect as gifts :) I love them. I also love the new layout kendra, good job! Thanks! Haha I figured I should change it up for the new year!! i adore the gold dipped one! They look awesome! I just have to say though because I read your about page, I have two saint bernards and that alone deserves a comment. These look great! I love the gold dipped one, its so cute!